When it comes to nutrition, Tell it like it is! Information clarity is about to get real! I heard about this news from the FDA last week. I like it. Being more real about "serving size" would be the biggest benefit for me. Who eats half a bag of M&M's anyway. Eliminate the math and tell it like it is. The big food brands worry that the truth will slow down consumption, purchase, and profit. But we get healthier! Seems fair to me! What do you think? Here's a link to a post by MyFitnessPal that shares six reasons for the recommended changes. In a space where customer interaction is increasingly digital and where customers increasingly use key technologies, CMOs and CIOs are working outside their existing comfort zones. It only makes sense for them to do it together. In my monthly column for Insurance and Marketing, I shared my thoughts about the growing importance for these two members of the C-Suite team to "buddy up!" You can read the by clicking here! Some of you are aware that I write a bimonthly column for MARKETING - the Northwest publication for marketing and communication professionals. My most recent submission takes a look at the practice that a handful of powerful brands have adopted - leaning on their marketing partners for extended payment terms to gain a competitive edge and increase corporate profits. Now that I think about it again, I'll add that the practice being discussed is actually a false edge. The short term advantages it creates comes at an extreme price. These brands, regardless of their size and stature, appear to be blind to the cost of their powerful demands. Instead of gaining a sustainable advantage, overbearing brands often lose the trust and respect of their partners and, most importantly, their customers. I'd like to invite you to read two perspectives on this behavior - mine, and my partner's in the publication - Digital Kitchen CEO, Bill Fritsch. Please click here to be taken to the full story. 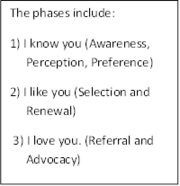 There’s a three-phased, seven-step model that I refer to as The Advocacy Engine. 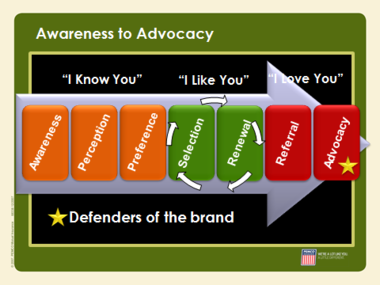 When I first considered it, I thought of it as a linear process that enabled brands to move consumers from awareness to advocacy. Today, I think of it more as a cycle of increasing momentum for brands that approach each phase and step with purpose and clarity. People are talking. Is anyone listening? There's a powerful message for marketers embedded in the elections taking place this week. The voice of the customer is alive and well. It's the time in our country when we are reminded that the voice of the public really matters. Our insights, opinions, the things we like, and the things that wear us out come to the surface of conversations and debates. Loyalists and advocates for candidates, causes, initiatives, and groups have raised their voices in family rooms, coffee shops, town hall meetings, and many other face-to-face venues. Social networks are abuzz with status updates, blog entries, and highly efficient tweets that are expressly intended to let our friends, family, and members of the voting public - that we've never even met - know what matters to us and who we're convinced are the best candidates to solve the issues that we consider important. The volume of our communication is at a level like never before. And what we say matters. Of course, listening matters too. Last week I attended the second annual Content Marketing Retreat in Langley, Washington. During the course of the two day event I interacted with thought leaders, service providers, sole proprietors, non-profits, and representatives of regional business both large and small. Without exception I was impressed by the passion, interest and understanding about the importance that should be placed on the voice of the customer. I had the opportunity to open the event with keynote remarks that focused on marketing fitness, content excellence, and making meaningful connections. Please read on for a summary of thoughts that I shared during the retreat. Focus on fitness, communication, and connections. Focus is a very good thing! Earlier this month, as the new year began, I boldly posted an entry to this blog declaring that I would have "No New Resolutions" in 2012. The reason, simply stated, is that my resolve to accomplish a few specific goals in 2011 needs my continued focus and commitment. To spread myself too thin only deverts my attention from the most important things. As a PEMCO colleague likes to say "Keep the main thing the main thing." Within days of my post, Russell Sparkman, the founder of FusionSpark and organizer of the second annual Content Marketing Retreat in Langley, Washington, contacted me with the following question. "With focus being core to your success, what would you say is the most important area of focus for marketers in the coming year?" "Almost all of the top producers that I know are always seeking an edge. They’re always looking for a new idea, a new approach, or a new way to create value for their clients. They want some edge that will allow them to produce even greater results, and they are open to trying new things to get those results." Are those with an Edge Coachable? What kind of people would you expect to be continually looking beyond the obvious to see what others don't? Competitive people? Driven people? Self starters and people with ambition? I suspect many of those who strive to see the edge would be described like that. In addition, I think words like curious, inquisitive, bright, and accomplished are words that could be used. And what do edge seekers do? Are they executives, sales people, athletes, artists, scientists? Might they be public servants, philanthropists, and volunteers. Or are they simply the cream of the crop. The people who make it to the top in every walk of life? As social media becomes the focus of attention for marketers, it is essential that we not forget the power and influence of good old fashioned face to face conversations. Early in my term as Word of Mouth Marketing Association (WOMMA) Board President, I expressly commissioned an Offline Word of Mouth Task Force, headed by former board member Stuart Sheldon, to advance the awareness and importance of offline conversations in order to bring emphasis to this critical area for our membership. At last week’s WOMMA Summit, the task force convened a conversation to discuss the importance and relevance of offline word of mouth marketing. In addition to Sheldon, who is the Co-President of Escalate, members of the task force and panel included Brad Fay, COO of Keller Fay Group, Chris Laird, CEO of Tremor, and Idil Cakim, VP of NM Incite. Among the topics discussed was: "What is offline WOM? How is it similar to or different from online WOM?" Awareness of word of mouth marketing and the importance that consumer driven communication is playing in the business community continues to increase at an astonishing rate. Increasingly, conversations are taking place about identifying talkers, loyalists, and advocates. The momentum and movement has found its way out of the experimental idea centers of marketing departments and is showing up in corporate board rooms, vision statements, and strategic planning discussions. Listening to the customer is in style again. And this time, the consumer has the power and the tools to make a very real difference. For more on this topic please advance to The WOMMA Edge, right here. How do you sell a product that people don't understand, don't want to buy and when they do buy, they don't want to use it? And how do would you engage your customers in a way that creates loyalty and advocacy? While this sounds like a very tough sell, the company where I am the C.M.O., PEMCO Insurance, has been recognized as one that does it very well. I was recently invited to discusses the journey with Bruno Aziza on Microsoft's Business Intelligence TV. We talked about a few of the ways that companies like PEMCO employ social media tools for relationship management and customer engagement. To see the video and learn more, just follow the "read more" link below. Selling protection... And I don't mean condoms! Just about the time you come to grips with the fact that there is a great chance that you're responsible for marketing one of the most unremarkable and uninteresting product categories on the face of the planet, something comes along to make you think twice. Now don't get me wrong, insurance isn't the only product that people wish they didn't have to buy that I've promoted in my career. There were the do-it-yourself auto parts like carburetors, starters, and alternators. I still smile when I think about the fact that sales of those replacement parts went up when the price went down by putting them on sale. Who stocks up on starters and alternators anyway? Have you ever thought about where your career nourishment comes from? That part of what you do that gives you an amazing feeling of success and accomplishment? The part of your responsibilities that make work feel like you are going to fun and leaves you feeling proud of what you are contributing? I hope you have. Because by thinking about these questions, and answering them, you will enable yourself to better see and experience your edge. I've come to describe it as something like the root system of a young tree that is maturing and growing over time. I'd like to tell you a story of a career, as if it were a tree. If you don't know your why, your what and your how don't matter. Do you remember being a child? How about raising a child? I do. And I remember that in both situations a frequently asked question was "why"? Why this, why that, why now, why not? I also remember the lack of patience that my parents had with me when I asked "why" and that the most frequent answer to my questions was a simple “because… that’s why.” I’m sorry to say that I’m guilty of repeating the same behavior and lack of patience with my own children when “why” was on their minds. I'm convinced now that "why" is one of the essential, central questions in our lives. For each of us to know our own answer is very important.